Chat is tied to individual Beacons and mailboxes. 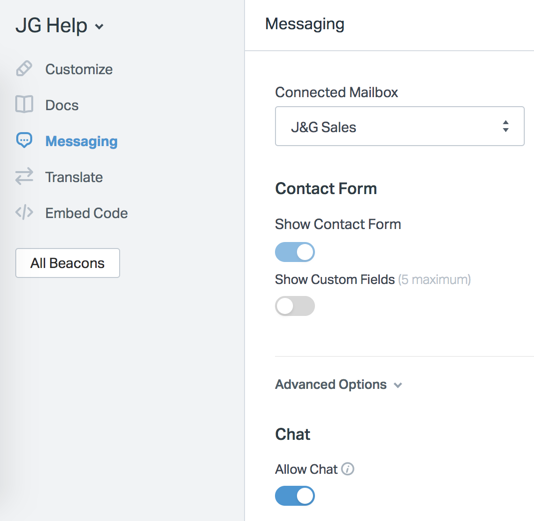 For example, you might have a Beacon on your help site that offers live chat and sends messages to a customer support specific mailbox. When chat is enabled in a Beacon, you’ll see a new Chat link appear in the left-hand sidebar in Help Scout. Click on the Messaging tab in the left sidebar. Turn the Chat toggle on. Hit the blue Save button. Before you can start chatting with customers, you'll need to set your chat status to Available and make sure that you're set to take a reasonable amount of chats. To view the chat interface, click on the Chat link in the sidebar. A red notification dot means there are chats waiting to be accepted. The count you see next to the Chat icon reflects the number of waiting chats, plus any active chats that are assigned to you.